Our expanding fleet of cabs helps us to provide an unparallel travel experience to our esteemed guests. We occasionally source some vehicles from a large pool of verified taxi operators whom we deal with. Car hire for outstation or car hire in Delhi are made easy through our customer friendly booking engine www.cabsforyou.com. You may book a cab online for local use under the 8hours/80km option in these key cities or pay as per actual distance travelled under the km option for any inter- city travel. We also provide cabs for travel on monthly basis with a limit of 300hours/3000km. Monthly travel packages can be tailor-made for companies or individuals. 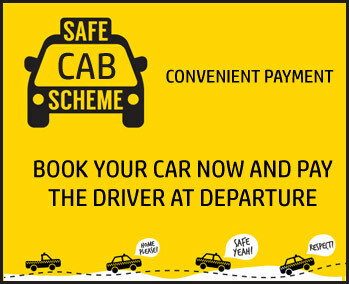 You may visit our customer friendly website www.cabsforyou.com to book a cab online, email at reservations@cabsforyou.com or call +91 - 9999854828 to book offline. Cabsforyou.com is also providing a facility to book hotels online. We have associated with FabHotels to provide a range of 400 + 3 star budget hotels in over 35+ cities in India including New Delhi, Mumbai, Bangalore, Chennai, Hyderabad and more. Call us at 9999854828 for special deals. Planning a vacation with your friends or family or looking for a weekend getaway from a trustworthy service provider, Cabsforyou.com offers a one stop solution for your journey by road! Best service guarantee and an assurance of instant bookings.